There are a few things which you need to know before starting to work with Facebook ads. Things like what type of audience to target or the design of your ad or your investment on first campaign should be pre planned. We will talk about the right amount of money you should spend on your first campaign and the good number to aim for your campaign or your product. If you are concerned with the things mentioned above then you are at the right place. The first thing that you need to figure out even before starting out the ad is the profit margin of your product. So, you must calculate the difference between the price of the product that you want to sell and the expenses from AliExpress. Doing this is very important because you can only afford to spend more money on ads only if your product price is higher. In this way you can balance out your expenses. So, its very important to figure out your profit margin. Second thing that you need to decide is the maximum amount of money you are willing to spend before you start making adjustments. We suggest you to aim for double of your profit’s margin amount. For example, if your profit margin is $20 you can spend $40 before making any adjustments on the ad. You can end the end if it is being a failure. Do not confuse this money with your daily budget. Depending upon the price of your product this will last for a few days or even a week. Set your budget to $5 to $10 when test the ads at first. In case you are on tight budget you can stick with $5 and $10 dollars to speed up the process if you think your product holds a good potential to get sales. Basically, you have to keep your budget to $5 to $10 a day until your profit margin turns double. After this you can make adjustments accordingly. Once you get to know your profit margin and figure out your daily budget then it’s the time to figure out the direction in which you want to test split your product. You can either test one product with multiple audiences or you can test multiple different products with one kind of audience. Decide what you are confident in. Whether it is the product or the audience. For example, if you sell jewellery on your site and you are not confident about which product is going to get maximum sales on running Facebook ads for it. In such case we suggest you to test multiple products with the like audience. In this case you are trusting your audience more than your product. By doing this you will get to know that which product goes best with your audience and you will get your winning product. Say you have a winning product that has your confident. In this case you should not test different products because you already have the winning product that has the best potential. Once you have the winning product, you can test it with different audiences. If you do this you will get to know which audience will work best with which audience. If you still want to test more products even after getting the winning product remember not to mix the two. There are many people out there who are not confident about their audience and their product both. What they do is that they try to test multiple products with multiple different audiences. You are doing a big mistake by doing this as you are not really testing anything at this point of time. You need a common denominator or a baseline in order to test so that you can get to know what is working and what is not. So, make sure you have same products or the same audience so that you can figure out issues in one of them in order to make adjustments. We suggest you to test five to ten different ads at a time. Say you have five or six necklaces that you think can do well, you can run five or 6 different ads and test all of them. If you have one winning item you can test that one product with as many different audiences as you want. Don’t test for less than five or more than ten audiences at one time. You should aim between five to ten. You must figure out the amount you want to spend for your first run of ads. Being on a conservative side if you run five five-dollar Facebook ads, it will cost you $25 per day. If the product that you are selling has the profit margin of $10, you must wait for at least four days to make adjustments. So, the total amount on that campaign will cost you around $100. Say you have eight ten-dollar ads, it will cost you around $80 a day. If the product has a higher profit margin of like $30 you can spend $480 before you make any adjustments. $480 is a lot of money when you are only utilizing it for testing but you have to remember that you only need 16 sales to maintain a balance between price and the profit margin by running 8 ads for just 6 days. It might look a huge amount for some people but it is relative to the ad in the product that you want to sell. So, you might get an idea yet that how much you need to spend on your very first Facebook campaign or any other campaign in the future. 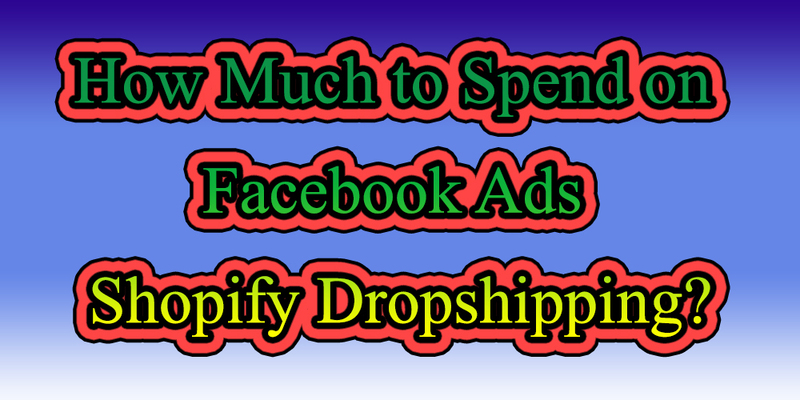 You need to keep in mind that there is no particular guide to how much money you need to spend on Facebook ads. People do a lot of experimentation with their Facebook ads ad they can get different results based on how much money spend. As we have already said that there is no hard and fast rule for how much money to spend on Facebook ads. We have tested with few products and ran ads for t-shirts on a Dropshipping store. We sold those t-shirts through the Shopify store. We have Dropshipped those t-shirts via printful. We have then created Facebook ads that pointed to the t-shirt on that Shopify store from Facebook. The amount that was spent on that ad per day was $3. It got very much success as we got profit of at least $7 on each sale. Basically, we got more than what we spent making it one of the biggest reasons to be put in those ads. The most important element for deciding how much you should spend on Facebook ads is the price of the product that you plan to sell. For example, if you are making a profit of just $2 per product sale you should not spend $3 per day for Facebook ads and if you are getting a profit of say $100 da day, you can spend any amount as you want in a hope that you will get at least one sale a day. Product margins and how many sales you are getting in a day are both very important to know. If you are getting back more money than you spend on ads then it means every penny you spend on ads is worth it. It is very common for beginners to spend $10 a day for Facebook ads and not getting back any profit. You will be in total loss if you do this. It is very important to put out some tests out there when it comes to Facebook ads. In this way you can figure out what works and what doesn’t work. Firstly, you need to figure out the amount you are willing to spend on these tests at the very first stage. It is very common to lose money on some ads so you need to keep some money in hand so that you can put it on stake. You need some money for the whole process of putting out the ads first and then you wean out some ads which don’t work and focus on ads which get success. What you should do is to choose a product and different variants of an ad and target the different audiences. Put a $5 ad a day for each variants of a same ad. It will cost you $50 a day in total. Now you have to see if any if those ads are making any conversions and point out which are getting maximum number of clicks, most engagements and diverting traffic to your website. Stop those ads which are not getting you any benefits. Keep running ads which are making profit. Duplicate and scale these ads up. Foe example, if you are sending a $5 per day on a ad and it is making a few sales and giving you profit, make a similar ad and spend $10 a day on that ad which is making money. The second ad will most likely get success. Basically its not about how much money you are spending per day but it is more about how much money you are ready to spend, what is the profit margin on your products that you can spend on ads and can still make a profit, finding those two numbers doing testing at the early stage, weaning the things down and growing the ads that are successful and losing the failed ones. You can get success at $3 a day and also at $10 a day. Less than $3 will not get you any profits as in such low amount your ad will not reach to enough people and Facebook will not be able to get you enough test data for you to make decisions. If your ads are not reaching out to enough people and you are not getting any sale it might be the case that your ads are not reaching out to enough people making chances of your sale less. So, make sure that you don’t go below $3 a day for testing big enough audience to figure out if it will really work out. Many Dropshippers suggest $5 a day. You can go for $5 a day depending upon your budget. Being flexible and to be able to experiment with the results that you get is more important than the final monetary figure that you get. You should grow on your successful results.